Lieutenant-General Yvan Blondin, commander of the Royal Canadian Air Force (RCAF), spoke yesterday with aerospace industry leaders and academics about the Emerging Skies Initiative (ESI), which is being developed to collaboratively explore innovative solutions to future air power needs. “Emerging Skies is a Royal Canadian Air Force initiative that brings together the Air Force, Canadian industry and academia interested in jointly exploring and developing novel future concepts that will help fulfill Canada’s future air power needs in 2025 and beyond,” he explained. ESI is not part of the government’s procurement process and is not focused on seeking to procure or commercialize concepts in the short term. It does, however, follow the spirit of the government’s recently announced Defence Procurement Strategy, as both the strategy and the initiative underline the importance of early and continuous engagement with industry. “Early engagement will enable all ESI partners to gain a better understanding of the Air Force’s future needs,” said LCol Dany Poitras, who presented the RCAF’s initial ideas about how to develop and execute this initiative. The meeting was organized by CADSI. It was underlined, however, that ESI is not limited to members of CADSI. Anyone in the industry and academic sectors interested in working with the RCAF will be welcome to participate in ESI projects. Concept development projects will be introduced to industry and academia in various ways. The strong networking capabilities of organizations like CADSI will be leveraged in an effort to “get the word out” to all those who may be interested in becoming an ESI partner. The ESI website, and a collaborative web-based tool that includes a database linked to a wiki, will also be used to introduce and elicit interest in the new concepts to be developed. Interested partners can provide feedback through the website, and a steering committee will then refine the ESI concept. 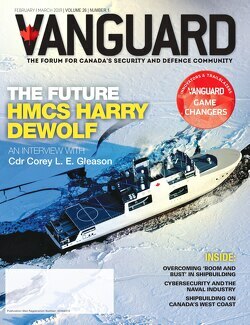 Concept development projects on various issues – such as the development of the RCAF future search and rescue concept – will then be launched starting in May.